After yesterday's über-girly nails, I felt the need to balance the 'girly' scales. Pardon the thumb, i smudged it stirring the simple syrup for the sorbet. I used OPI for Sephora Absinthe Makes the Heart as a base, this color is sooooooo gorgeous. 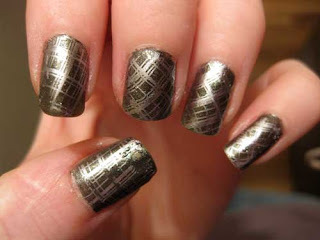 For the design I used China Glaze Sci-Fi Khrome with Konad Plate m60. And all that sounds oh so yummy! Wow! How do you find time to make all those yummy things from scratch and paint & post your nails each day? Nice design too. Those are pretty cool. Do you run a business doing this? Love this manicure. The plaid Konad is fantastic. Wow, those nails look great. You have imagination. Nicely done. wow.. awesome.. its looking beautiful.. its really good.. i like the color combination.. thanks for updating..